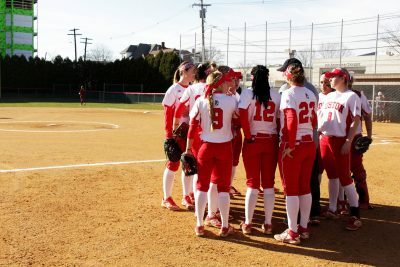 The Boston University softball team stumbled out of the gate at the Madeira Beach Tournament, losing its first two games. However, the Terriers (5-4) fought back to win their final three games of the tournament. The Terriers dropped the first game to Eastern Michigan University 7-6. Junior Sydni Overly started the game on the mound and she lasted five innings, giving up six hits and two runs while striking out five. Taking the loss for BU was freshman Kali Magane, as she went two-thirds of an inning while giving up two hits and two runs. On offense, catchers carried the load, with sophomore Alex Heinen and senior Gabi Martinez hitting home runs. The Terriers were winning 6-4 heading into the last inning, but a three-run rally by the Eagles (3-3), capped off by a walk-off single by outfielder Michelle Kriegshauser sealed the deal. The Terriers lost 1-0 in the second game of the tournament to Oakland University. This game was highlighted by the pitcher’s duel between Magane and senior Erin Kownacki. Magane was on the short side even though she pitched seven strong innings and struck out four. Kownacki pitched a three-hit complete-game shutout. The only run of this game was freshman Jamie Squires’ home run in the fourth inning. The Terriers got back on track in the third game against University of Alabama at Birmingham, winning 5-3. Overly started and lasted two and a third innings, giving up three runs and three hits. Magane pitched the remainder of the game and she did not give up a single run. For the Terriers, Martinez hit two home runs and drove in four runs. The other run was a solo homer by Heinen. BU continued its winning ways in the fourth game of the tournament, beating Quinnipiac University 8-1. Senior Makinna Akers started and went the distance, only allowing one run and two hits. The Terriers blew this game open in the third inning when they scored four runs. Martinez led the team with two RBI. In the final game of the tournament, BU came out victorious against Southern Illinois University 5-4. Freshman Lizzie Annerino made her first career start, where she lasted one inning and gave up three hits and two runs. Magane came in relief and pitched the remaining six innings, giving up two runs and six hits. Magane earned the win, which brings her season record to 3-2 with a 2.21 ERA. She leads the Terriers in both wins and in ERA. BU took the lead in the fifth inning thanks to RBIs from both sophomore infielder Alexa Ponce and junior infielder Kaitlin Sahlinger, and they never looked back. The Terriers look to continue to improve next time they take the diamond at the San Diego Classic, which starts Friday, March 3.